I have this thing for combining my favourite foods into one dish. Mapo tofu and waffles? Done. Banh mi and fries? Been there. Mac and cheese with shepherd’s pie? It’s delicious! It seems wrong, but it’s oh-so-right. I’m constantly thinking about what food mash-ups (for lack of a better term) will taste good. 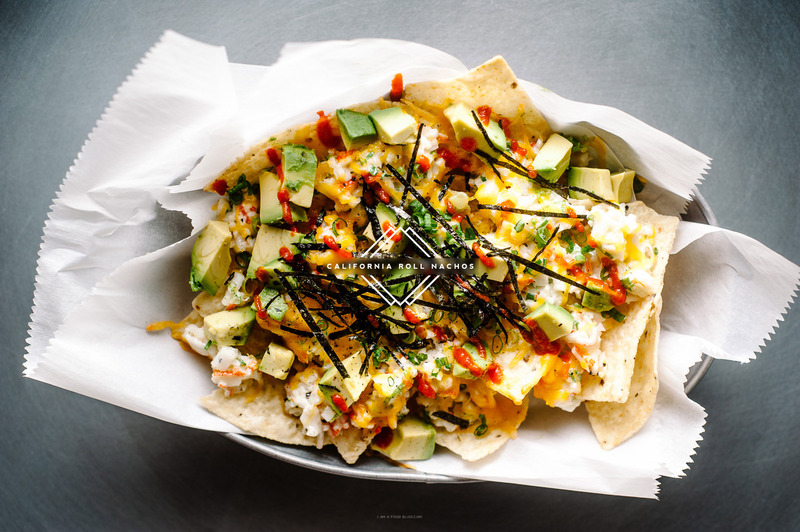 Hence, these California roll nachos. I love nachos. I love California rolls. 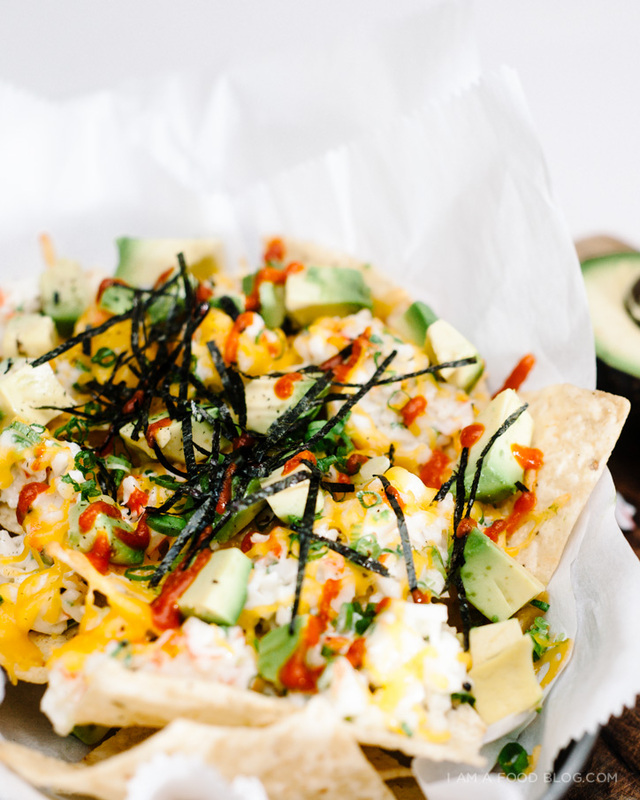 Of course I LOVE California roll nachos. Sure, they’re essentially the illegitimate child of Japanese and Mexican cuisine, but considering the fact that California rolls are by no means traditional Japanese food (same with nachos and Mexican food), then it was inevitable that they would come together in a glorious delicious pile of flavours covered in melted cheese. Preheat the oven to 400°F. Line a baking sheet with foil or parchment paper. 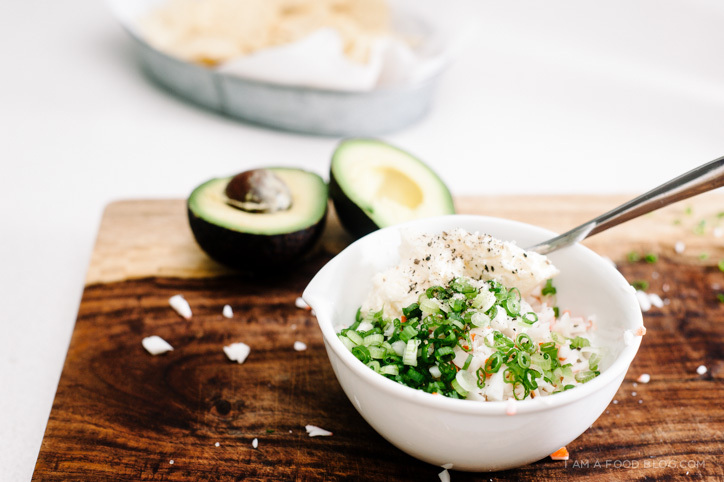 In a bowl, mix together the crab, mayo, and 1/4 cup sliced green onions. Taste and season with salt and pepper. Place a single layer of chips on your lined baking sheet. Top with the crab mix and a generous sprinkling of cheddar. Bake for 5-7 minutes or until cheese is gooey and melted. Remove from the oven and top with the remaining sliced green onions, diced avocado and seaweed strips. Drizzle with sriracha, if using. Enjoy hot! * You can go all fancy here and get real crab meat or you can just go the route of imitation crab meat, which is what I used. These are hands down the coolest nachos ever. LOVE! 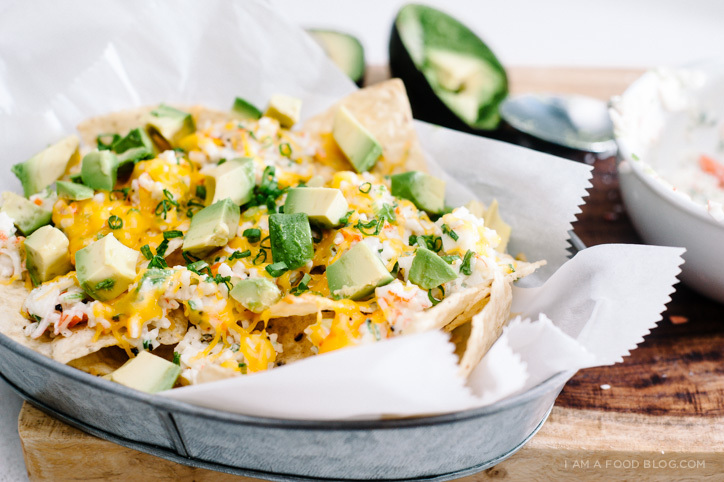 Girl, these nachos!! heck yes! GE. NI. US. It’s all I can say right now because I’m drooling. Brilliant idea, a perfect pairing! I’m a fan of french fries dipped in milkshakes/ice cream, but I’ve never actually combined them. I’d love to try a french fry milkshake! Whoa- so interesting! I am loving these food mash-ups! i loooooove the idea of smashing favorite foods together to make a new awesome food (and i have a not-so-secret love of mapo tofu so i’ll have to try it in combo with waffles… or maybe fries, haha). love this! This looks terrific, but I wonder… why not wonton chips? How fantastic that would be. I might add in a little wasabi powder to the kewpie mayo. I love the simple ingredients of this dish and it sounds so good! This sounds like the perfect future football food to add once season starts! Just in time for football season!! YOU’RE AMAZING. Like I was just telling Cynthia, I’m planning a nacho bar for a bday gathering this sat…do we share a brain?!? This is SO SO PERFECT. PHENOM!!!!!! You’re crazy and that’s a compliment. But that crazy sure worked in this recipe. I must be crazy too. if you had a food truck it would be INSANE. like, in the best way. 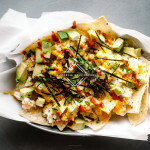 cali roll nachos!??? love!!! Oh gosh, I need these in my life. Extra avocado, please!! Looks fantastic, definitely trying out! This sounds too good to be true! It’s fantastic you came up with such a great recipe!! OMG This sounds amazing!!! Would this still taste good if I used regular mayo instead of the kewpie mayo?